After reaching the top of the game as a corporate winemaker, Stephen Pannell has established his own boutique label where he is challenging the status quo and producing a range of stunning wines suited to Australian sensibilities. 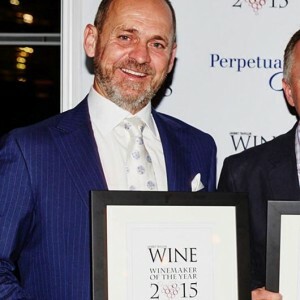 In many ways, Stephen Pannell’s journey to the 2015 Winemaker of the Year Award reflects the journey of Australian wine over the past 50 years. It began in Margaret River when his parents, Bill and Sandra Pannell, established what has become one of Australia’s iconic boutique wineries – Moss Wood – in 1969. In the early days of a region with no wine culture or infrastructure, establishing a vineyard and winery was unrelenting hard work. It was largely the memory of how demanding it was that saw Stephen turn down the opportunity to take on Moss Wood when Bill Pannell decided to sell. A spell working for Jim Whittle at Halvorsen Cellars in Sydney in the 1980s was one of the steps along the way to a winemaking career. Gaining experience with great producers in Burgundy, Bordeaux and Barolo was another. Stephen Pannell worked for BRL Hardy for a decade from the mid-90s, mostly as senior red winemaker. He won the Jimmy Watson Trophy for his first vintage at BRL Hardy’s Tintara Winery and quickly gained a formidable reputation for his restrained oak handling with shiraz and grenache. The takeover of BRL Hardy by Constellation in 2003 provided him with an opportunity to rethink his attitude to wine. He resigned from the corporate winemaking life, and he and his wife Fiona Lindquist established S.C. Pannell. They had no vineyards and no winery. However, his time in the McLaren Vale and his reputation as a winemaker meant that he was able to source prime fruit from the region, including parcels of ancient, dry-grown grenache and shiraz. While his focus and heart are very much in McLaren Vale, he has close connections with the adjacent Adelaide Hills and sources exemplary sauvignon blanc, pinot grigio and syrah from the region as well as his white blends, Bianco and Aromatico. Two key things influenced the judges’ decision to anoint Pannell as 2015 Winemaker of the Year. Firstly, the sheer class of his wines across an extensive portfolio. We enjoyed drinking them and their quality has shone through, evident in his recent show successes. Secondly, we were attracted by the philosophy he espouses and the articulate manner in which he presents it. It’s a holistic philosophy that starts with our climate, places great importance on the vineyard and encompasses his attitude to wine and winemaking, as well as wine’s relation to the food we love to eat. Employing this philosophy, Pannell questioned the status quo. “I live by the ocean and catch garfish, squid and whiting, yet I made big voluptuous reds with high alcohol. Wines from southern Mediterranean countries like Portugal, Spain, Italy and Greece are made with varieties that suit the climate and the foods they produce. The 2008 vintage from hell was a turning point. It went from looking unbelievably good to one that produced shiraz with a Baumé as high as 26?. I decided to look for varieties that were more suitable to the climate and to find new ways to manage the vineyard,” he explains. Things have changed, too, for the Pannells. It began with the 2012 purchase of a vineyard at Blewitt Springs planted in 1891. It had contributed half of the 1995 Eileen Hardy Shiraz that won him his first Jimmy Watson. Back then he said to the vineyard owner, “If you ever sell, could I please buy it?” He feels the 18-year wait was worth it. Last year, the Pannells bought the eight-hectare Tapestry vineyard on Olivers Road, in the heart of McLaren Vale. It’s a beautiful site characterised by gnarled vines re-trellised on picturesque slopes. The chardonnay that was planted there is now touriga and the riesling has been grafted to tempranillo. He’s keen to explore other Mediterranean varieties such as assyrtiko, aglianico and xinomavro. The purchase came with the Tapestry function centre, so the Pannells are spending a year seeing how that works out. It’s also a spot where Pannell has found a creative outlet for his love of cooking. Importantly, though, the wines are stunning. The 2013 Adelaide Hills Syrah won him a second Jimmy Watson Trophy; the 2013 Tempranillo Touriga won four trophies at the Australian Alternative Varieties Show at Mildura, an earlier vintage won him the Bushing King title at the McLaren Vale Wine Show; both his grenache and nebbiolo are among the country’s best examples of the varieties. His work with blends is also groundbreaking. The small family wine business now has a home and, driven by Pannell’s prodigious work ethic, is expanding rapidly. There are chapters still to be written, but the story thus far makes him a deserving winner of the 2015 Gourmet Traveller WINE Winemaker of the Year.